Red Bull Storm Chase Irland – Mission 1 Complete. 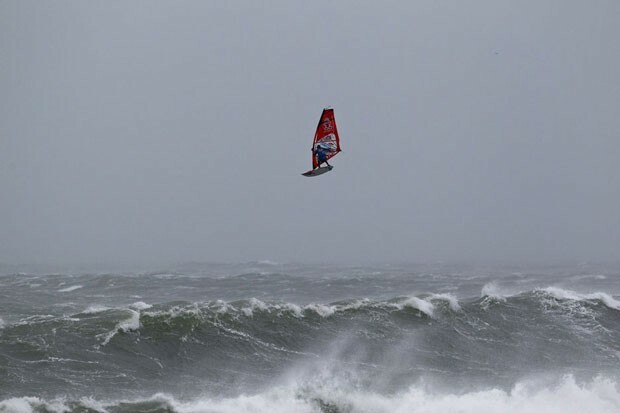 After a ground-breaking day of hurricane-strength windsurfing, six sailors – Marcilio Browne, Dany Bruch, Victor Fernandez, Robby Swift, Julien Taboulet and Thomas Traversa – advance to Mission 2 of Red Bull Storm Chase. 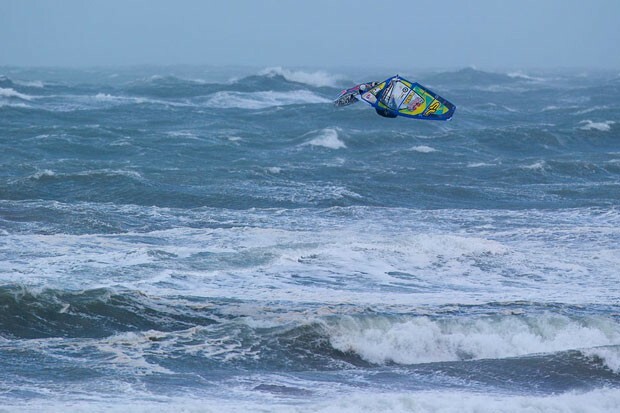 With wind speeds peaking at over 70 knots and angry, 20-ft waves, the ten competitors on Mission 1 completed three rounds of competition at two spots in Brandon Bay, Ireland. 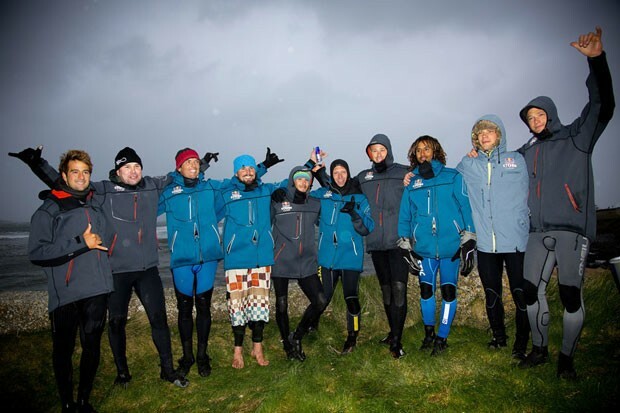 Ten of the world’s best windsurfers from eight countries completed a demanding competition in Kerry, Ireland during the first mission of the Red Bull Storm Chase –the most-challenging windsurfing event of all time. 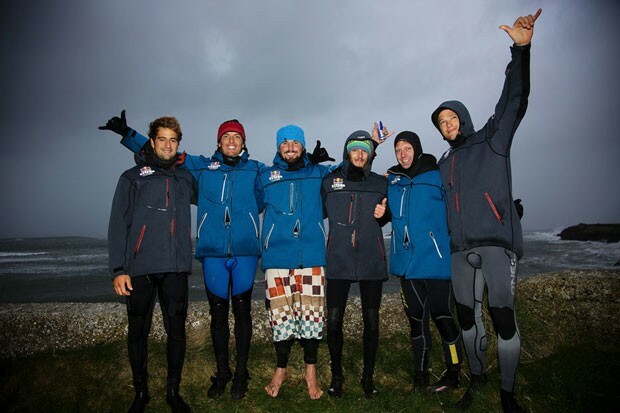 Despite recorded storm-force gusts of up to 74 knots (137kmh) and fierce 20-ft waves, after possibly the most radical day in windsurfing history the top 6 surfers move on to the second mission. BRANDON BAY (Ireland). When it comes to places you really don’t want to be at the moment, Dingels Peninsula in Ireland is right up there. This bleak outcrop of craggy rocks reaching out into the cold waters of the Atlantic is dominated by menacing black storm clouds bringing freezing rain, hail and winds of up to 90mph to the huge waves pounding the shore. While for many people a trip to Dingels Peninsula may sound like a journey to the gates of hell, for a select group of ten windsurfers competing at Red Bull Storm Chase it’s pretty much as good as it gets. Since August 2012 the athletes from Brazil, Spain, England, Germany, Denmark, Morocco and Cape Verde have been sitting, watching and waiting for the most extreme storms on the planet to break, bringing huge waves and powerful winds. Brittany in France, Galicia in Spain, the south-east coast of Japan, the north-west of Tasmania and the East Coast of the USA around Cape Hatteras were the other locations on the storm chasers’ watchlist this weekend. But nowhere on Planet Earth was the swell as huge as off the coast of Ireland. Wearing special wetsuits designed to absorb major impacts and fitted with a GPS to locate the wearer, the world’s best windsurfers jumped straight into the churning waters in preparation for a truly memorable session. Red Storm Chase is not only about winning the battle against Mother Nature, but doing it with style. Watched by the judging panel and a few hardy souls braving the weather, it were Victor Fernandez (ESP), Thomas Traversa (FRA), Julien Taboulet (FRA), Robby Swift (GBR), Marcillio Browne (BRA) and Dany Bruch (GER) who showed the best overall impression displaying superior wave selection and super high aerials. These six now get to wait for the next big storm to hit until March 22. The four best riders of the second round advance to the third mission scheduled from 22nd July onwards. The winner of the third and final Red Bull Storm Chase mission will then be crowned the “king of the storm chase”. The four best riders of the second round advance to the third mission scheduled from 22nd July onwards. The winner of the third and final Red Bull Storm Chase mission will then be crowned the “king of the storm chase”.